Was it a typo when the CEO mandated that the organization "institutionalize incompetents"? If not, how did the company wind up institutionalizing incompetence instead? How to Work for an Idiot is still the confessions of a recovering Idiot Boss. After decades of writing and consulting, Dr. Hoover finally realized that many of the people he kept trying to "energize" and "enlighten" were, well, idiots. More importantly, he was an idiot for thinking he could change them. 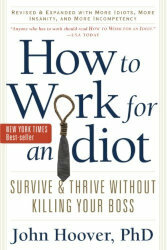 This new edition of How to Work for an Idiot is bigger and better--and filled with even more idiots--than before. The same technology that has enabled cluelessness from the corner office to go viral can help you protect yourself and keep your inner idiot in check. Yes, the book goes that deep. Not every boss is an idiot, and not every idiot is a boss. Let Dr. Hoover help you find the wisdom to know the difference. John Hoover, PhD, is a popular executive coach and leadership/communications consultant. In former lives, he was a writer, line producer, and project director for the Marketing/Entertainment Division at The Disney Company and a divisional general manager with McGraw-Hill. He has helped dozens of clients in the corporate and public sectors, including ABC Television, Delta Air Lines, The Disney Channel, HBO, IBM, Hilton Hotels, Motorola/Verizon, Xerox, and many more. His clients welcomed him, praised his work...and sometimes even waited until he left the building before completely ignoring his advice. Dr. Hoover teaches at Fielding Graduate University and leads the Executive Coaching Practice at Partners in Human Resources International. He is the author of more than a dozen books on leadership, creativity, and high performance.